Hot water is a Hot Commodity, and we often don’t realize how true this is until it’s too late. We take for granted those hot showers and clean dishes, until it’s not as simple as turning that faucet handle any longer. Let us keep you in hot water! 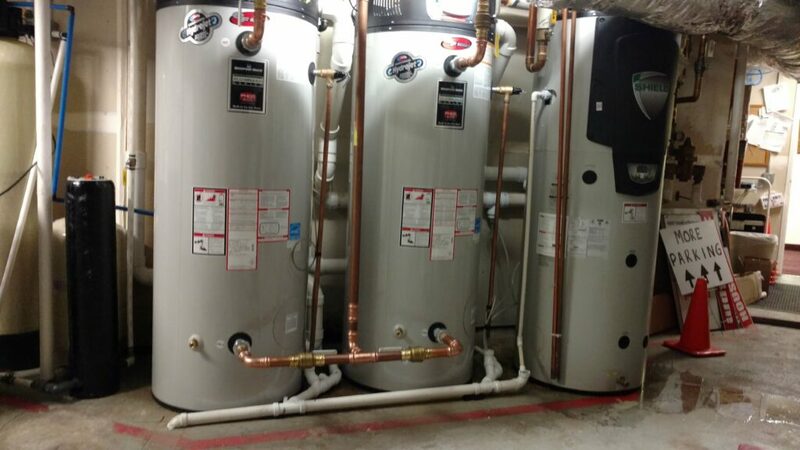 We offer a number of services to ensure your hot water stays on demand; We Install the classic Hot Water Tank, Tank-less Water Heaters, and an assortment of accessories designed to maximize the performance and output of your Hot Water System. The Conventional Storage Tank Water Heater is the most commonly used, and the type that likely comes to mind when you think of water heaters. The classic tank model that we are all used to seeing is likely what you will find in most Homes and Businesses. Rooter Right not only replaces these models but we are well equipped to Diagnose and Repair them as well. They say a good tank will last you twenty years, and with Proper Maintenance and Professional Care, there is no reason they can’t go beyond the twenty. 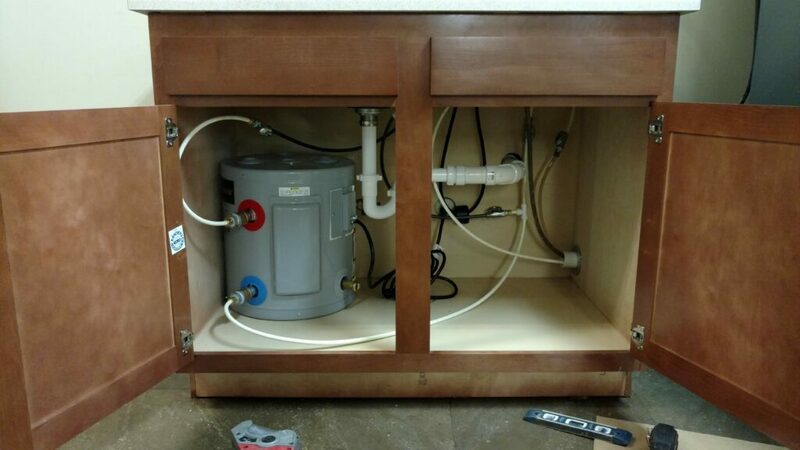 We service Water Tanks of all types from the smallest 5 gallon tank hiding under a sink somewhere, to the large 99 gallon tanks and well beyond. Keeping up with the latest trade technology and techniques, through Continuing Education Programs, allows us to work through your system with ease and in a timely fashion. We realize just how important that hot water is to the functionality of your Home or your Business. Whether your Water Tank is Standard Vent or Power Vent, Gas or Electric, we have the capability of servicing and restoring it in an effort to maximize the use you get from your investment. So, before you decide it’s time to replace your Water Heater, give us the opportunity to save you money and bring life back to your appliance. We replace: Control Valves, Thermocouples, Thermostats, Elements, Power Vent Motors, Dielectric Unions, Valves, Anode Rods, Thermopiles, Burner Assemblies, Control Boards, Igniters, and any other part or portion of a Water Heater that can fail and cause you trouble. We also perform Maintenance Cleanings including removing sediment and lime scale from the interior of the tank. There comes a time in the life of each water tank that it is just no longer capable of handling the demand put on it. The tank itself might be compromised due to rust and decay causing leaks in the storage area, or it may be well beyond its years and just breaking down and becoming unreliable. Regardless of the reason, your Hot Water Tank simply won’t last forever. When the time comes, count on the Professionals at Rooter Right to transition you into a new model flawlessly and with as little downtime as possible. We Install New Water Heaters of any Size, any Capacity, and any Capability. Whether the Setting is Commercial or Residential, we have a water heating solution to fit all needs. Schedule a Consultation with one of our technicians to discuss your needs. Let us get a feel for what is important to you so we can properly choose a style, brand, and size that fits your unique situation. Technology is forever changing, especially in the realm of large appliances. Here at Rooter Right we are up to date and up to the task. Regardless of whether we are performing a simple tank swap, or totally redesigning your system with an upgrade from standard vent to power vent, or a tank model to a tankless, we are the solution team. 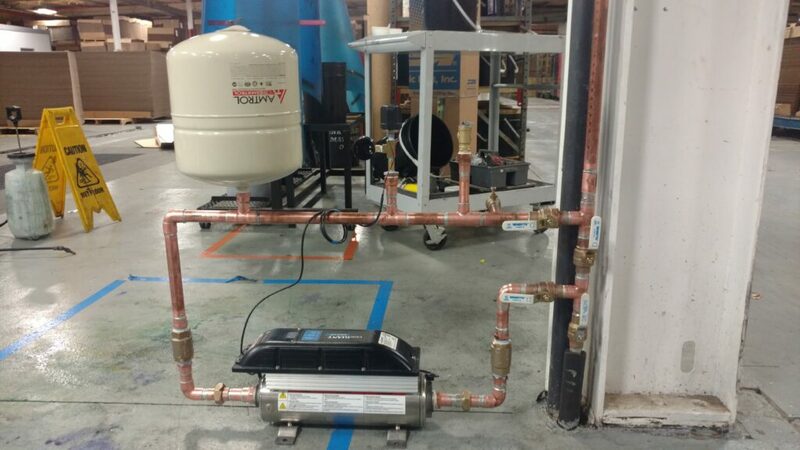 For our Commercial Customers with larger needs, we are fully equipped to install multiple tanks or Tankless models plumbed in series to handle large demand. 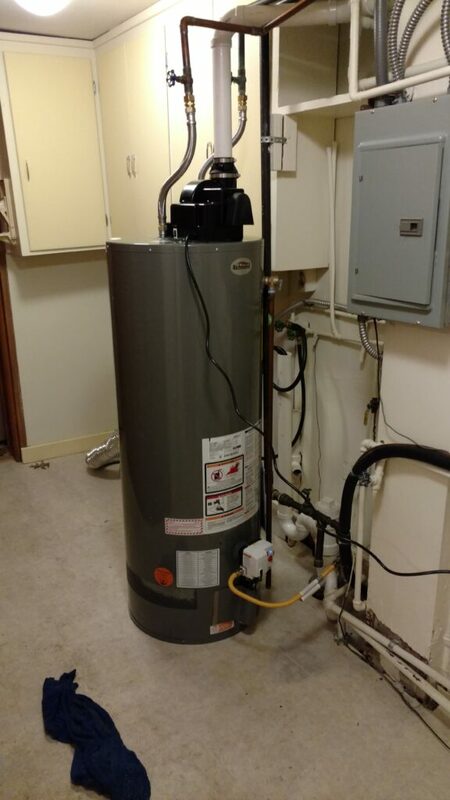 With Rooter Right’s experts your not only getting a New Water Heater, your getting the peace of mind that it has been Professionally Installed to maximize performance as well as longevity. Ask about our Extended Warranty Program for details on how you can further protect your investment. Tankless options provide a few key attributes that traditional tank models just cannot compete with. For those families fighting over who gets the first shower, or waiting for the dishwasher to finish its cycle before you can shower or do laundry, a tankless model might be your savior. 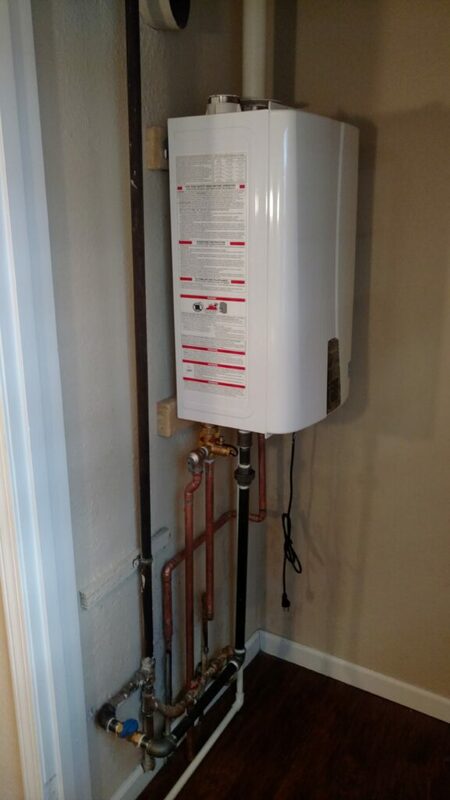 One of the best features of the Tankless model is an endless supply of on demand hot water. With tank models you can be limited in the amount of hot water you can use at one time. Once you’ve reached a certain amount of use, the peak temperature drops and continues to drop until it runs cold. Recovery time can then take up to two hours depending on the model tank you have. Tankless Water Heaters use heating coils that heat the water almost instantly as it moves through the pipe giving you a seemingly endless supply. The fact that the Tankless is only heating water when there is a demand for it, makes the appliance much more efficient. In a standard tank model, water is being heated at all times regardless of whether or not hot water is being used. This means you are constantly running up your gas bill maintaining the water temperature. Save money overtime using energy only when it is needed. Another valuable aspect of Tankless models is that they take up far less space than a standard tank model. This space can be crucial for homes without basements, or that have fully finished basements. It is also important for businesses where every square foot of your space counts. Tankless models can be tucked in a closet or other small space, which can be much more aesthetically pleasing. While upfront costs can be greater than that of standard tank models, over time, energy spending is reduced due to the extraordinary efficiency of tankless water heaters. Space and long-term cost savings make tankless models a great choice in both Residential and Commercial environments. There are a number of additions to your water heating system outside of your actual water heater appliance. Many municipalities are now requiring expansion tanks to be installed with your Water Heater. The purpose of the expansion tank is to combat thermal expansion of the water as it is heated. Thermal expansion can lead to excessive pressure which can cause hazards to your Water Heater, your Plumbing Lines and Fixtures, and even your home or business in general. We also install circulation systems that move hot water through your pipes at all times, this ensures that long waits for water to get hot are eliminated. Hot water is ready at the tap every time you turn it on. There are various other accessories and systems we can inform you on and incorporate into your Home or Business. Rooter Right can help you get up to date with changes, adjustments, and upgrades. Schedule a Consultation or an Annual Check-Up and we will make sure you have everything you need to get the most from your system.